Prices are for a MINIMUM order of 12 total pennants, mix or match. Below is the current design for all NHL team pennants. 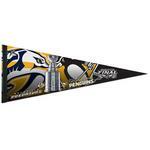 Prices are for a MINIMUM of 12 team pennants (MLB, NFL, NBA, NHL or NCAA). Less than 12 will cost $3 each. Click on the desired team(s) and choose the quantity selection for each team. Size is 12x30. You get one of each NHL team. You get all 30 NHL teams in one package.